I have a simple rule when it comes to travel: the fewer things you carry, the more fun you’ll have. Next time you’re in some European city on a vacation, just cast an eye at the tourists around. I think you’ll find the guy with the huge backpack on his back looks like he’s on the first leg of his journey through purgatory. You wouldn’t wander around a mall with 45 lbs on your back and call it a good time. Don’t wander around the world with a 45 lbs on your back. Go with a 10 lbs bag on your back. Here’s how. Here’s my list of clothing and backpacks that I use. 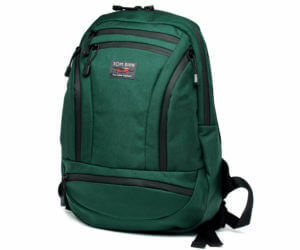 Originally, I bought the Tom Bihn Synapse 25 bag, which is a slightly larger 25-liter backpack. I found it a little too big for my needs, so I swapped it with my girlfriend’s 19-liter version. The bag is designed with travelers in mind. The compartments are designed as 3-D pockets, so packing items in one compartment doesn’t reduce space in others. It’s remarkably compact for all the things I can fit into it, and I can easily slip it under the seat in front of me on an airplane. And there’s a reason why it works so well. Tom Bihn designed this bag with minimalist travel in mind. Cotton towels take up way too much room in your bag. For example, a large beach towel would easily fill up my Tom Bihn bag. Worse still, they dry slowly and start to stink if you don’t wash them. Professional swimmers have the same problem, as they always to need towels for training, so I looked at what type of towels they use. They use sport PVA towels. Personally, I have one from Speedo. It’s designed to be kept damp in a plastic bag or container, so you don’t have to worry about drying it. 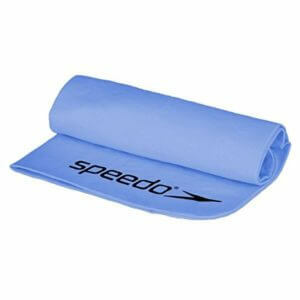 It’s the preferred towel for pro swimmers. Alternatively, you can go for a micro-fiber towel. In my experience, they start to smell terrible after a few days if you don’t properly dry them, particularly in tropical climates, but on the plus side they do dry quickly and are fairly thin, so they pack down easily. When it comes to pants, a pair of jeans fails in terms of performance. Denim, the fabric of jeans, dries incredibly slowly and doesn’t perform well in wet, cold or warm conditions. You’ll end up freezing in cold, wet conditions or overheated on hot days. At the same time, I find merino wool doesn’t stand up to the rough and tumble when used in pants. Therefore, I looked into the world of performance pants, including brands such as Betabrands and co. 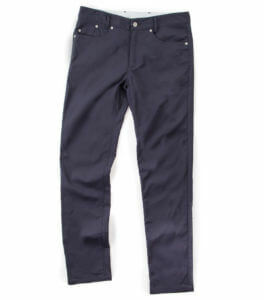 In the end, I settled on Outlier Slim Dungarees pants. While not cheap, they are incredibly long-lasting – I have one pair for coming up to 3 years now – and they look good in a variety of situations. They’re coated with a NanoSphere treatment, so water rolls off the surface, rather than soaking in. When they do get drenched, they dry very quickly. They are designed for cycling, which I do regularly, but they work fine for in the office, travel and more. 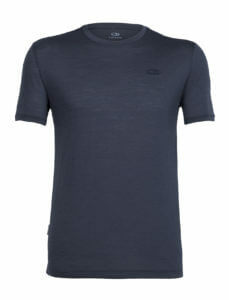 As the name of this site gives away, I’m a huge fan of merino wool t-shirts. They keep you warm when it’s cold, and cool when it’s warm. They don’t smell, ever, no matter what you do. I pack two Icebreaker Tech Lite Short Sleeve Crew t-shirts for my travels. I’ve tried different brands such as Finisterre, but this is the one that fits me personally the best. Rain gear can take up a ton of room in your baggage. 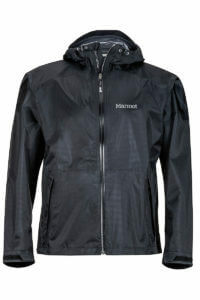 I bought the Marmot Mica, which is the lightest functional rain jacket that I could find at the time. I have it for four years now, and I keep in permanently in the right side pocket of my bag, so it’s easy to access when needed. It weights a mere 198.4g or 7oz. I also pair it with my insulation jacket for extra warmth when there’s a lot of wind. I like that it has two pockets, and it packs down into itself. Unfortunately, the Marmot Mica has been discontinued in some markets. Therefore, if you can’t get the Mica, you’ll have to look at other options that I’ve listed below. If I were re-working my packing list, I’d start with replacing your cotton socks with 2 pairs of merino wool ones. 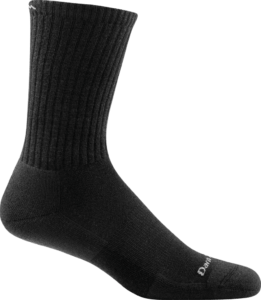 You can find more about the recommendations over on my article on merino wool socks. 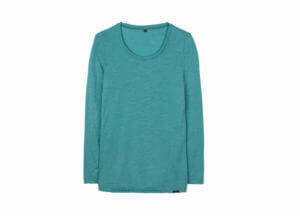 They’ll give you all the advantages of merino wool: no smell and great performance in a range of temperatures. I operate on a “wear one, wash one” schedule. That forces me to wash regularly, and I don’t fill up my backpack with dirty clothes that I need to wash.
My rule is that every item has to go with every other item. The whole system works as a modular system for any type of weather conditions. I bought the ladies slimmer dungarees from Outlier. Unfortunately, they no longer make women’s clothing, so I’m on the lookout for a new brand for next time. It was the perfect pairs of pants – always totally black and in perfect condition after almost 2 years. The woman’s Fiske Hoody from Finisterre. This is made of 80% merino wool and 20% polyamide. The advantage compared to the Icebreaker models I’ve tried up to now is that you can wash it in a washing machine, which is a big plus. I have the Porthia Vest and the Eddy Base Layer from Finisterre. 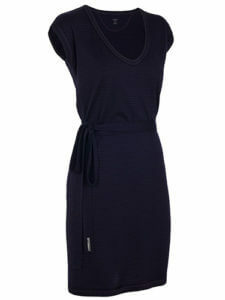 My favorite piece of clothing is my little black dress: the Villa Dress by Icebreak. I have it for 6? years now. They currently don’t produce it (but might again? Let me know if they do). 2 pairs of socks from Darn Tough. 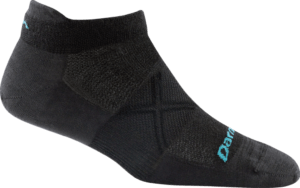 I tried quite a few different brands of merino socks, and they’re the best so far. They last longer – 6-8 months each, bearing in mind I only have 2 pairs and I wear them daily. They take a little longer to dry as the wool is denser than other socks. I have the Solid Rib Basic Crew Light and the Solid ¼ Sock Ultralight. 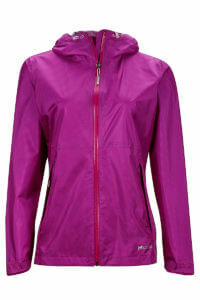 I have the Crystaline Jacket from Marmot. Here are the various additional non-clothing items that we pack. I’m often working while traveling, so I bring a laptop. Personally, I switched to Apple a while back, and I never looked back. In terms of travel, I like Macs because I find they boot up very fast, and they’re surprisingly well built. 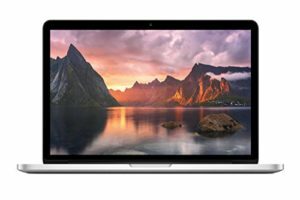 Today, if I were in the market again for a laptop, I’d probably go for a MacBook 12″, as they’ve increased the screen resolution, the #1 criteria for productivity on a laptop in my view. They are even smaller than my 13″ MacBook Pro, and can easily handle whatever tasks I throw at it. Your phone will hold your maps, your tickets, your bank account and reservations all on one device. And that’s just the start. It’s basically your travel assistant. Currently, I have an iPhone 6. It works well with the Apple ecosystem, and it does the job perfectly for what I need. My girlfriend has an iPhone 6s, so it is handy having interchangeable charging cables. In my opinion, apps are designed first for the iOS systems, and then for Android systems, so that’s why I go for Apple. 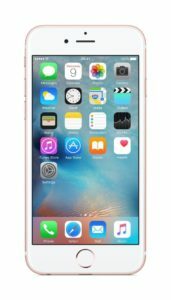 They are expensive, however, so budget Android phones pack much of the utility of an iPhone at a fraction of the price. Within Europe, roaming fees have been abolished, so you can just buy a good pre-paid mobile sim and use it throughout Europe for your stay. In Germany, I use the 5GB Aldi Talk package, which gives me 5GB of data for 30 days. When I’m outside of Europe, I just buy a prepaid sim card at the airport with a data allowance. My attitude is traveling and taking photos has evolved over the years. There was a time when I didn’t take many photos while traveling. Now, I enjoy taking photos as small personal missions while on the road. It’s fun to think up some creative shots, plan them and then take them and finally share them with the world. Therefore, I’ve started carrying a bigger camera with me. 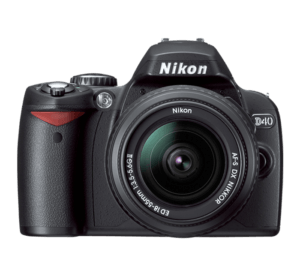 I have a Nikon D-40 digital SLR camera. It’s getting on to be 10 years old at this stage, so I wouldn’t recommend it as a purchase today. If I were purchasing a replacement, I’d go for the Nikon D3400 as it works with my existing lenses. The lense is a critical part of the package. The D-40 came with a 18-55mm zoom lens. However, it doesn’t do too well in low light conditions. I recommend that you try a “prime” lens, which is a lense that’s perfect for taking hand-held shots in low light, thanks to the fast f/1.8 lens. You’ll get the “bokeh” look where the background is blurry but the subject is sharply in focus. On full-size cameras, the diameter of a prime lens will be 50 mm, but you have to convert this diameter based on the type of camera system you have. 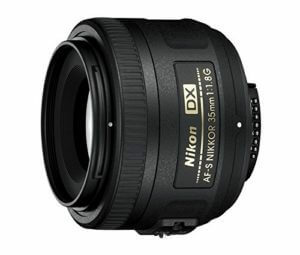 It converts to 35 mm for the Nikon DX range of cameras or to 18.5 mm on the Nikon 1 range of mirrorless cameras. This hardly needs much explanation. I’ll throw in a travel adapter if I need one for the destinations I’m going to. Getting a bulletproof financial set up when traveling is key. For instance, if you’re in Bali without cash, and your credit card company decides to block your card due to suspected fraud, you’ll have a rough few days until you can get some cash. Banks with mobile apps so I can handle my finances from my phone, such as transferring cash from my saving account to my current account. A Paypal account with some money transferred over to as an emergency reserve. 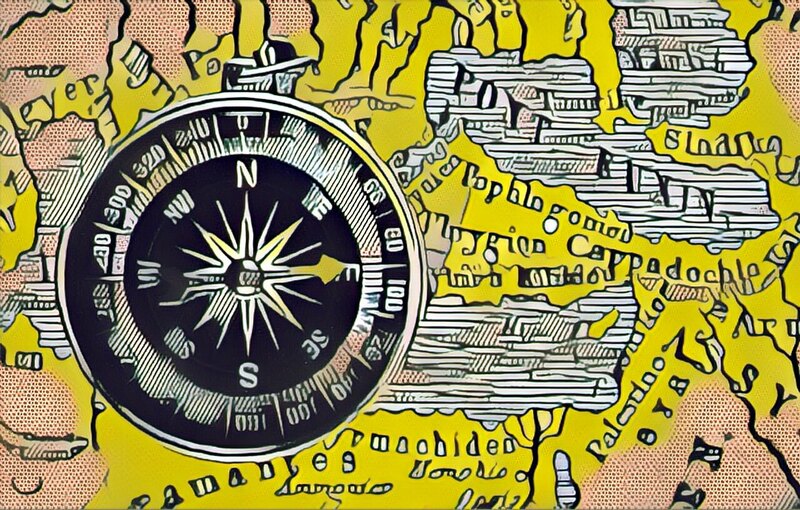 I live in Berlin, Germany, so I opted for an N26 MasterCard and an ING-DiBa Visa card. N26 offers free withdrawals in the EU and free payments in foreign currencies abroad. 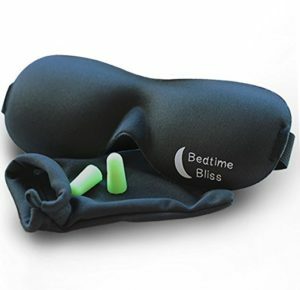 This is a tiny addition that makes it much easier for me to sleep on planes, trains or in dorm rooms. I haven’t found the perfect one yet. The Bedtime Bliss mask is a good option, because it’s contoured around your eyes, making it more comfortable to wear. Basically, you can blink without brushing up against the mask. Okay, so this is not a defendable option for an ultra-light traveler. But I like to bring at least one extravagant luxury with me on trips. 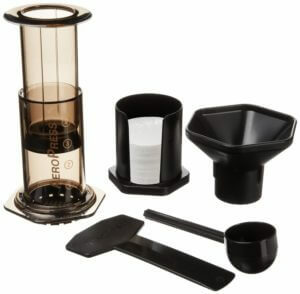 For me, that’s coffee from my AeroPress. In my opinion, for price and size, you won’t get a better coffee, and it packs down to a fairly small size. You just might get a few quizzically reviews at the airport, but so far it’s never been an issue. The upside is amazing coffee just about anywhere (including on airplanes!). You should buy this and read the text on the package. It’s wild. Get the peppermint flavor. 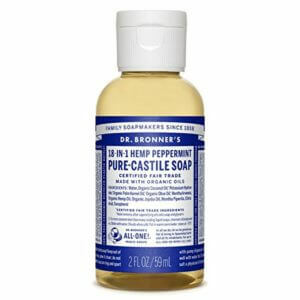 This soap works for shampoo, body wash, hand washing clothes and even toothpaste. I get it in travel-size containers so it meets the limitations on liquids. Personally, Peppermint is my flavor. It makes you feel super fresh!